Why am I going to have to buy the above-mentioned beat 'em up, you ask? Because the folks at Behemoth are finally--on Feb. 8--going to release a DLC pack that allows gamers to play as the Pink Knight. "Pink Castle Crasher pt. 2" by artist Phill Gonzales. Unfortunately, I discovered shortly after viewing said video that the Pink Knight wasn't a playable Castle Crashers character--a fact which killed most of my enthusiasm for the game. Of course, it also kept me from running out and buying a PS3 (or an Xbox 360) right then and there, so I guess it wasn't a completely negative discovery. Does that mean I'm going to run out and buy one of those systems now? No, but I'm sure to do so eventually--and when I do, Castle Crashers (and "The Pink Knight Pack") will be among the first games I download. Gay. Very gay. I LOVE IT! Yes! I especially love the lollipop, for some reason. I wonder what the other weapons will be? 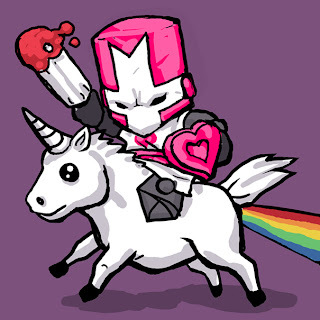 Hey Bryan there is DLC for Castle Crashers now where you can play as the Pink Knight. Win! I wish they would've come out with some DLC besides just character packs though.. But The Behemoth is releasing a game like it called Battle Block Theatre. It's going to be awesome! I agree, Jacob -- non-character DLC would have been cool. As for Battle Block Theatre -- I'm looking forward to that, too! More Kirby in 2011? Yes, please!